These pots are such a revelation... very healthy, super easy and really tasty! Perfect for office lunches or evenings where you're short of time... bung everything in the jar, add boiling water and you're good to go! Fill it up with your favourite veg and get creative... there are no rules with this one! Get a 1 litre mason jar with a lid (you'll probably end up wanting to make this recipe all the time so it's worth getting one). 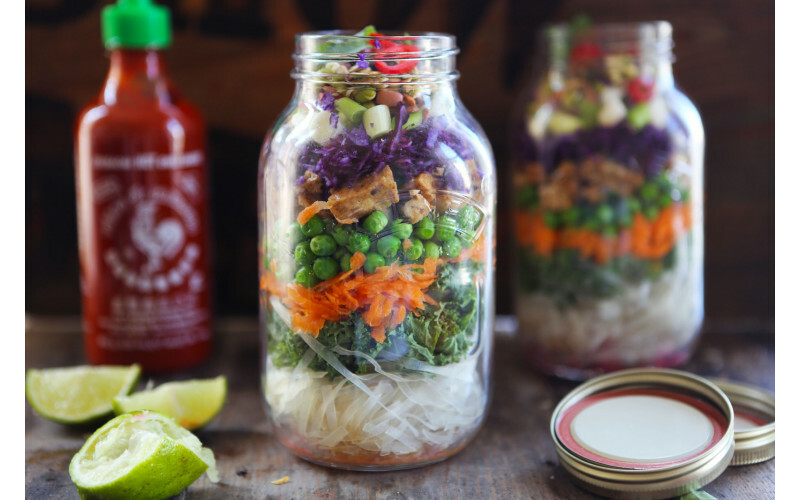 Put the liquids and pastes into the bottom of the jar and then fill the jar up in layers with your favourite combination of noodles, veg, seeds, sprouts, tofu etc or use the ingredients mentioned above. Fill the jar to ¾ full of boiling water, straight from the kettle. Stir thoroughly, put the lid back on and leave to sit for 10 minutes.